Science of the Saints, 30-XII-2018 (17 Dec.), The Holy Prophet Daniel and the Three Holy Children, Ananias, Azarias, and Misael. In the years following 600 B.C. Jerusalem was conquered by the Babylonians, the Temple built by Solomon was destroyed, and many of the Israelite people were led away into the Babylonian Captivity. Among the captives were also the illustrious youths Daniel, Ananias, Azarias, and Misael. The emperor of Babylon, Nebuchadnessar, gave orders to instruct them in the Chaldean wisdom, and to dress them in finery at his court. But they, in cleaving to the commandments of their faith, refused the extravagance and led a strict manner of life; they indeed sustained themselves on only vegetables and water. The Lord granted them wisdom, and to Saint Daniel – the gift of perspicacity and the interpretation of dreams. The holy Prophet Daniel, having preserved sacred faith in the One God and trusting on His almighty help, in his wisdom surpassed all the Chaldean astrologers and sorcerers, and was made a confidant to the emperor Nebuchadnessar. One time Nebuchadnessar had a strange dream, which terrified him, but upon awakening he forgot the details of the vision. The Babylonian wise-men seemed powerless to learn what the emperor had dreamt. Thereupon the holy Prophet Daniel gave glory before all to the power of the True God, revealing not only the content of the dream, but also its prophetic significance. After this Daniel was elevated by the emperor to be a lord of the realm of Babylonia. During these times the emperor Nebuchadnessar gave orders to erect in his likeness – a huge statue – to which it was decreed to accord the honours befitting a god. 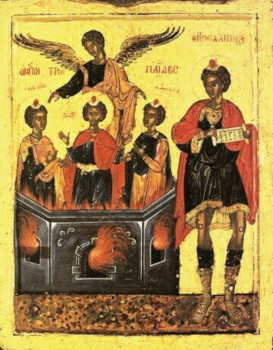 For their refusal to do this, the three holy lads Ananias, Azarias, and Misael were thrust into a burning fiery furnace. The flames shot out over the furnace 49 cubits, felling the Chaldeans standing about, but the holy lads walked amidst the flames, offering up prayer and psalmody to the Lord (Dan. 3:26-90). The Angel of the Lord in appearing made cool the flames, and the lads remained unharmed. The emperor, upon seeing this, commanded them to come out, and was converted to the True God. Under the following emperor Balthasar, Saint Daniel interpreted a mysterious inscription (“Mene, Takel, Phares”), which had appeared on the wall of the palace during the time of a banquet (Dan. 5:1-31), which foretold the downfall of the Babylonian realm. Under the Persian emperor Darius, Saint Daniel was slandered by his enemies, and was thrown into a den with hungry lions, but they did not touch him, and he remained unharmed. The emperor Darius then in rejoicing over Daniel gave orders throughout all his realm to worship the God of Daniel, “since that He is the Living and Ever-Existing God, and His Kingdom is unbounded, and His sovereignty is without end” (Dan. 6:1-29). The holy Prophet Daniel sorrowed deeply for his people, who then were undergoing righteous chastisement for a multitude of sins and offenses, for transgressing the laws of God, resulting in the grievous Babylonian Captivity and the destruction of Jerusalem: “My God, incline Thine ear and hearken, open Thine eyes and look upon our desolation and upon the city, in which is spoken Thy Name; wherefore do we make our supplication before Thee, trusting in hope not upon our own righteousness, but upon Thy great mercy” (Dan. 9:18). By his righteous life and prayer for the redeeming of the iniquity of his people, there was revealed to the holy prophet the destiny of the nation of Israel and the fate of all the world. During the interpretation of the dream of the emperor Nebuchadnessar, the Prophet Daniel declared about the kingdoms replacing one another and about the great final kingdom – the Kingdom of our Lord Jesus Christ (Dan. 2:44). The prophetic vision about the seventy of weeks (Dan. 9:24-27) tells the world about the signs of the First and the Second Comings of the Lord Jesus Christ and is connected with those events (Dan. 12:1-12). Saint Daniel interceded for his people before the successor to Darius, the emperor Cyrus, who esteemed him highly, and who decreed freedom for the Israelite people. Daniel himself and his fellows Ananias, Azarias, and Misael, all survived into old age, but died in captivity. According to the testimony of Sainted Cyril of Alexandria, Saints Ananias, Azarias, and Misael were beheaded on orders of the Persian emperor Chambyses. Previous Previous post: Science of the Saints, 29-XII-2018 (16 Dec.), The Holy Prophet Aggeus.